Lorna Fencer Napurrula - Lajamanu artist paints Yam Dreamings and related ceremonial stories. Acknowledged as one of the great innovators of the Warlpiri art movement from Lajamanu, Lorna Napurrula Fencer (1923- 2006) was both a fierce and gentle custodian of her culture. She painted the great Napurrula-Nakamarra creation stories from her brother’s custodial site at Yurmurrpa. These ceremonial stories re-enact the myths of the Ancestors who dug out the first yarla, or bush potato, from the earth around the underground water source at Yurmurrpa. Embedded in the swirling shapes of the bush potato leaves are the “U” shapes of the Napurrula and Nakamarra women, who remain the custodians and the beneficiaries of their great Ancestors’ achievements. The travels of Napurrula and Nakamarrra kinship or skin groups are the inspiration for Lorna Fencer Napurrula’s work, and she was a custodian of the Dreamings associated with bush potato (yarla), caterpillar (luju), bush onion, yam, bush tomato, bush plum, many different seeds, and (importantly) water. Lorna Napurrula Fencer was a senior Warlpiri artist, born at Yartulu Yartulu, and custodian of inherited lands of Yumurrpa in the Tanami Desert. In 1949 many Warlpiri people, including Lorna Napurrula Fencer were forcibly moved from Yuendumu community by the government, to go a settlement at Lajamanu 250 miles north in the country of the Gurindji people. Napurrula managed to maintain and strengthen her cultural commitment through ceremonial activity and art, and asserted her position as a prominent elder figure in the community. Lorna Napurrula Fencer began her painting in the mid 1980s. Lorna Napurrula Fencer at her best is recognised as an artist who was a master of colour, carefully considering the impact as she laid down the paint on the canvas. 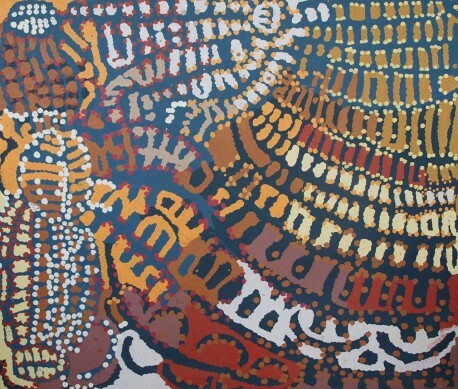 Her large epic canvases created in the eighth decade of her life were final and compelling statements about the power of the great Warlpiri stories that she painted for over twenty years. Lorna’s mother’s country was Yumurrpa. This is where the Yarla (Yam or Big Bush Potato) Dreaming track begins on its travels north toward Lajamanu. Her father’s country was Wapurtali, home of the little bush potato. Before she began painting on canvas in the mid 1980s, Lorna Napurrula Fencer painted on traditional women’s coolamons and digging sticks. Lorna Napurrula Fencer is represented in the Australian National Gallery and National Gallery of Victoria, in State Galleries and major private collections. In 2011 a major touring survey exhibition titled ‘Yulyurlu – Lorna Napurrula Fencer’ travelled around Australian institutional galleries. Aboriginal art status – Iconic artist.